A Word from Our Leadership Team! My advice would be to just join! I remember thinking about joining for a while before I actually did, but once I was in the program, I couldn’t imagine my life without being apart of it. The Leadership (Internship) Program is extremely rewarding. The program has helped me build character and gain a sense of professionalism and leadership skills. Through it I’ve made some of my closest friends. I would suggest you just take the leap and fill out the application. The HIM Internship Program has taught me many skills that are vital to my future such as organization, responsibility, and the importance of communication. Although I am still a teenager, I am learning important job skills and these traits can carry me far in life. Through the HIM Internship Program, I gain real work experience and I have met many other high schoolers through this program. Also, the other interns and officers have been so kind and are always willing to help me, which makes me feel grateful and happy to be an intern. This amazing program helped me become part of something big and impactful. I love the HIM internship program because it gives me an opportunity to volunteer while gaining leadership, management and communication skills. This program allows me to meet new people, learn from them and utilize those new skills to my own life. I get to learn more about the organization I volunteer for and how it functions so smoothly and orderly. Although it is the beginning of this internship, I have learned so much so far, and I'm eager to learn more information. 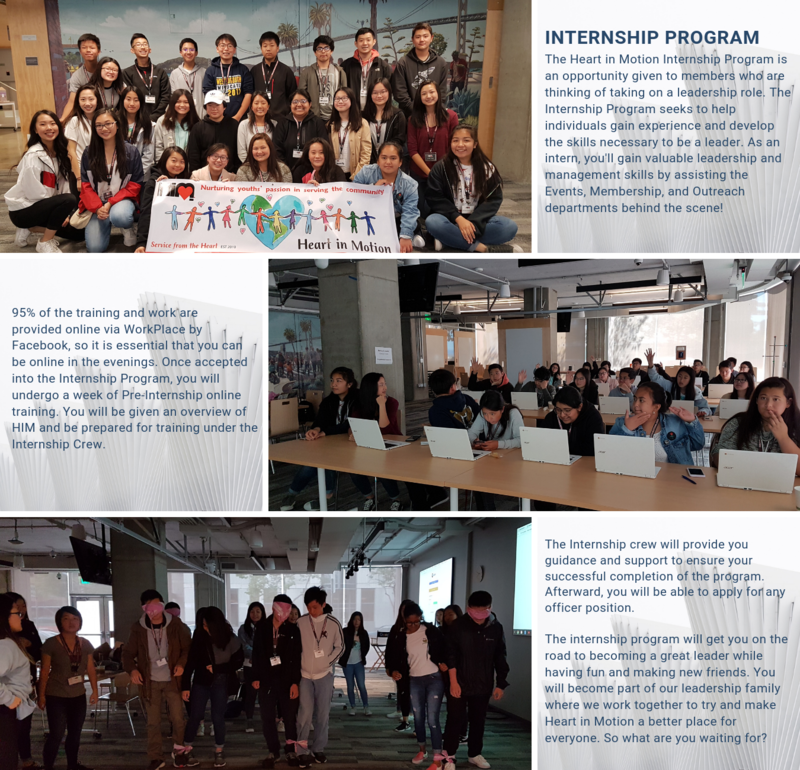 The HIM Internship Program is super organized and within these two and a half months, I have learned how much work it really takes to run such a successful organization. I have also been able to obtain several leadership and professionalism skills that I will definitely use in the future. The program has strengthened and challenged my work ethic, commitment, time management, and verbal & written communication. Furthermore, it’s amazing how the internship program is led by officers that have been previous interns within the HIM organization and it makes our leadership family more closely connected.